When children have moved beyond finger painting it’s a perfect time for a creative birthday party that truly be a work of art. Host your next birthday party at one of our bright and spacious art studios. Cost: $230+HST for up to 10 children. Any additional child is $10 to a maximum of 15 children including the birthday child. $100 deposit is required at the time of booking. Choose your project and lets have fun! We have tons of projects to choose from. If you don’t see something you like – share your idea and let us help you to create that. 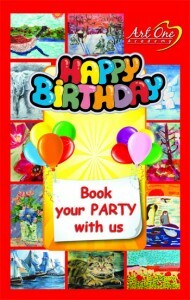 Send your inquiry and we will be happy to help you with organizing your special Birthday party!